The New & Improved 2017 Tour Itinerary is here. Make your plans to be on Omaha Beach on 6 June next year and register now before it is Sold Out! For 2017, MHT has improved our legacy D-Day Tour to make it a more comprehensive battlefield experience to include the equally epic struggle at Bastogne for the Battle of the Bulge plus a taste of the American Expeditionary Force in WWI! Recent D-Day tour participants have expressed the desire to see more of the european battlefieldsand we have answered that call! You can definately pay more and see less with some of our competitors. NEW FOR 2017! 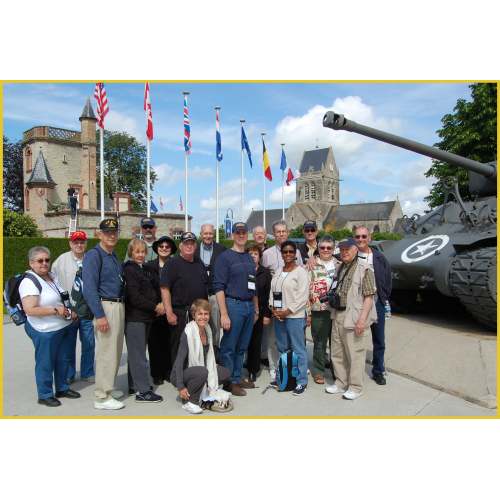 MHT is expanding our traditional D-Day tour to include the World War II Battle of the Bulge in Belgium. Of all battles fought by United States in Europe during WWII, these two are considered the most significant. Since the world is currently commemorating the 100th anniversary of World War I, we also will take a look into America’s involvement in this “war to end all wars.” A case can be made that WWI and WWII were the SAME war with a 20-year pause to repopulate the armies of the original combatants. This D-Day Tour has been designed to examine that connection. Please join us for a journey back in time. D-Day - June 6th, 1944. It has been 73 years but few events have galvanized a population and stirred the imagination like D-Day. As dawn broke over the beaches, thousands of real-life “Private Ryans”, British, French, Canadians and Americans, left the relative safety of their landing craft and stormed ashore to begin the Liberation of France. The Battle of the Bulge (16 December 1944 – 25 January 1945) was the last major German offensive campaign of WWII on the Western Front. It was launched through the densely forested Ardennes region of Wallonia in Belgium, France, and Luxembourg as a last gamble to halt the Allies advance. The surprise attack caught the Allied forces completely off guard. United States forces bore the brunt of the attack and incurred their highest casualties for any operation during the war but held the German columns and turned the tide for the invasion of Germany. United States enters World War I. American soldiers under General John J. Pershing, commander of the American Expeditionary Force (AEF), arrived in large numbers on the Western Front in the summer of 1918. They played a major role until victory was achieved on November 11, 1918. Military Historical Tours is proud to offer another in our series of signature European Battlefield Tours on this historic Seventy-Third Anniversary of D-Day. Our tours include exclusive MHT events, tour booklet & sites other tours bypass. Information on the events that are offered on your particular expedition will be included in your registration information packet. All of these things, along with the most experienced staff of Program Directors, Battlefield Tour Leaders and Historians will combine to make your trip the most enjoyable, relaxing, entertaining and educational experience possible. We welcome your phone calls, letters or e-mails to discuss your tour with one of our Battlefield Specialists. Call us toll free at 800-722-9501 we look forward to hearing from you! Historical trip information packet, containing maps & other tour information. Services of experienced Tour Leader and English-speaking local guides. Airfare not included: Get your own or Book Optional MHT Air-fare: Round-trip economy or business class airfare from your hometown to Par-is CDG price quoted upon registration! Day 1 – May 27– Departure. Depart today from your hometown airport for an International Portal for the flight to Charles De Gaulle Airport Paris (CDG). Dinner, beverages and a continental breakfast served aboard. Day 2 - May 28 - Arrival in France. Arrive at CDG and make your way to our conveniently-located airport hotel. MHT will provide a one night accommodations for two (with breakfast) in our airport hotel the night before your tour formally begins. You can be assured that once you arrive at the hotel, MHT will handle all the details for the remainder of your trip. A complimentary Wine Welcome is planned for early evening where you will meet the other D-Day tour participants. Meeting Hotel: Hilton Paris Charles de Gaulle Airport. Day 4 - May 30 - A Time Travel WWI to WWII - Reims to Bastogne. Our route will take us eastward through the beautiful countryside that once was a shell-scarred wasteland crisscrossed with French and German trench lines. The terrain feature known as the Plateau Chemin des Dames was the scene of fruitless attacks and stalemate. After The Great War, France faced a changed strategic situation. France had balanced Germany's superior population with an alliance with Great Britain and Russia. Russia had become the Soviet Union and memories of the war caused French leaders to distrust Britain. Consequently, France conceived of the Maginot Line, a line of concrete fortifications, obstacles and weapon installations constructed during the 1930s. We will take a two hour underground tour of Fort du Hackenberg, the largest single fort in the line with its 1000-man garrison. This is a real journey back in time and into the history of one of the most formidable fortifications of the 20th Century. Afterward, we journey to Bastogne, Belgium, with a brief stop at the Luxembourg American Cemetery where we pause to pay our respects to the fallen, including the late General George S. Patton Jr. Hotel: Best Western Melba Bastogne. Meals: B - Included. L&D - On Own. Days 5 - 6 - May 31 - June 1 - Battle of the Bulge. MHT is most fortunate to have as our local guide, Henri Mignon, a retired artillery officer of the Belgian Army. His family used to live in a small village north of Bastogne, in an area reoccupied by the German SS during the Battle of the Bulge. Though only 10 years old, he clearly recalls the hardships of the fighting and especially the day when his father was killed by an artillery round while getting the family water from the farm well. In the three days we are with Henri, we will visit McAuliffe Square with its famous Sherman tank, the Bastogne Historical Center, the "foxholes" of the "Easy Company" (made famous in "Band of Brothers"), the German Cemetery in Recogne, the "Siegfried Line" with its signature "Dragon’s Teeth,” the site of the in-famous "Malmedy Massacre" and one of only 11 German “King” Tiger II tanks remaining in the world. Henri will have special access to the Belgium military base from where General McAuliffe sent his famous reply, “NUTS!” to the German surrender demand 1945. Hotel: Best Western Melba. Meals: B -Included each day. L & D – On Own. Day 7 - June 2 - Drive to Normandy. Today we make the long drive to Normandy. On the way we will stop at the “Armistice Clearing” near Compiegne and a walk through the small museum housing a sister coach to Marshal Foch’s “Surrender Carriage” where WWI essentially ended and where the French capitulated to Hitler in June 1940. In a way, it is the place where WWI ended and WWII began. Hotel: Caen Moderne Caen. Meals: B - Included. L & D - On Own. Days 8 - 11 - June 3 - 6 - Normandy. Our hotel in Caen or Bayeux will be our home base for exploring Normandy. Omaha Beach was the most intensely contested beach on D-Day. It is six miles wide – the largest of all the five beaches. The entire beach was overlooked by cliffs which made attacking the area very difficult. You will walk the sands where the liberation of France began 73 years ago. 29th Infantry Division. Our tour will include the seawall, bunkers, and other German defenses along the beach. The western half of the beach was assigned to the untested US 29th Infantry Division. Vierville Draw where the 29th landed was featured in both "The Longest Day " and "Saving Private Ryan." 1st Infantry Division. The eastern half of the beach was assigned to battle-hardened 1st Infantry Division. The Big Red One stormed ashore and began fighting for its life on a strip of beach near Coleville-sur-Mer that had been marked the "Easy Red" on battle maps. Slowly, spurred by the individual heroism of many individuals, the move inland got underway. Pointe du Hoc. The 2nd Ranger Battalion scaled the 100-foot cliffs to eliminate the German heavy guns that could threaten both Utah and Omaha beaches. At a high cost, they successfully defended against determined German counterattacks for two days. The Pointe du Hoc Ranger Monument was erected by the French to honor the incredible courage of the Rangers. American Airborne Landings. In the early hours of June 6, 1944, the American airborne forces successfully executed some of the most difficult and challenging missions of D-Day. Their objectives were to secure the invasion right flank against German counterattacks and secure the causeways off Utah Beach. 82nd Airborne Divison. Paratroopers of the 82nd were to capture objectives in the area west of the Allied amphibious invasion, specifically the town of Sainte-Mère-Eglise and the La Fière bridge. Ste Mere Eglise. Another site made famous by the film, "The Longest Day." A mannequin of a paratrooper hangs from the church spire. The Airborne Forces Museum has a C-47 troop transport aircraft that flew in the invasion and a rare WACO glider on display. 101st Airborne Division. The 101st Airborne Division's objectives were to secure the four causeway exits behind Utah Beach to ensure the exit route for the 4th Infantry Division from the beach later that morning. Brecourt Manor. The 506th Parachute Infantry Regiment’s assault by Easy Company on the German howitzer battery that was disrupting the exit leading off Utah Beach was immortalized in the series “Band of Brothers”. It is often cited as a classic example of small-unit tactics and leadership in overcoming a larger enemy force. Utah Beach. The westernmost of the five landing beaches. The beach was situated on the east at the edge of a marshland zone which had been flooded by the Germans. Only four causeways could be used to cross this marshland and reach inlands. 4th Infantry Divison. The objective of the 4th, supported by airborne landings of the 82nd and 101st Airborne Divisions, was to secure a beachhead on the Cotentin Peninsula. The division only lost 197 men during the day and by the night of the 6th of June, 20,000 men and 1,700 vehicles were ashore. It was for his actions that day that Brigadier General Theodore Roosevelt, Jr., Assistant Division Commander, earned the first Medal of Honor of the division. Utah Beach D-Day Museum. Built on the very beach where the first American troops landed. A restored, original B26 “Marauder” bomber is among the displays. Overlord Museum. This privately-owned museum just outside the Cemetery gate chronicles the period of the Allied landing until the liberation of Paris. The collection was assembled by someone who was both a witness to the conflict and involved in the reconstruction of Normandy. Personal items from individual soldiers and armored fighting vehicles from the six armies in Normandy are presented in set displays showing over 35 vehicles, tanks and guns. La Cambe. At the somber German military cemetery at La Cambe, 21,500 German troops are buried, including Tiger Tank "Ace" Michael Wittmann. The design contrast with the Normandy American Cemetery is striking. The Normandy Tank Museum. This brand new museum stands on the site of the A10 Airfield built in 15-18 June 1944. Visitors can admire a superb collection that includes over WWII 40 tanks, truck, jeeps and airplanes, all in working order. The museum regularly holds outdoor demonstrations where visitors can even climb aboard the tanks and ride along a specially designed track for a truly thrilling and unforgettable experience. A Boeing PT17 Stearman and Piper L4 Grasshopper aircraft fly from the airstrip in aerial displays and offer sightseeing trips along the landing beaches. Pegasus Bridge and Museum. The bridges across the River Orne and the Caen canal had to be captured and held intact to enable the seaborne reinforcements to cross. The result was textbook example of a successful operation. German Merville Battery. The gun battery had to be put out of action. The 100mm caliber guns could fire down on to Sword Beach and the Allied fleet off the coast. Although successful, it was a nearly disastrous operation. On display is a restored C-47 aircraft from D-day. Sword, Juno, Gold Beaches. Drive along the British and Canadian landing beaches. Contrast the terrain differences between these beaches and Omaha/Utah beaches to be visited later. Arromanches. The remains of one of the two artificial "Mulberry" harbors erected in the landing operation may still be seen. Port-en-Bessin. A picturesque fishing port that was home to one of the 'Pipelines Under the Sea' (PLUTO) pumping stations. Longes-sur-Mer The German coastal defense battery at, probably the best remaining example of such a battery in Normandy. Bayeux. The first city of the Battle of Normandy to be liberated, and on 16 June 1944 General Charles de Gaulle made the first of two major speeches in Bayeux in which he made clear that France sided with the Allies. The buildings in Bayeux were virtually untouched during the Battle of Normandy, the German forces being fully involved in defending Caen from the Allies. Hotel: Caen Moderne. Meals: B-Included each day. L & D - On Own. D - Included last night. Day 12 - June 7 - Paris. We will bid farewell to Normandy and head for Paris. Rouen. The capital of Normandy. What makes this city unique is its incredible Gothic architecture coupled with half-timbered medieval street houses. A stroll through the quaint old streets of Rouen, in Upper Normandy, feels like a walk back in time. Cathédrale Notre-Dame. In the heart of the old town, it is one of the largest and most impressive Gothic cathedrals in France. The cathedral's main structure was built in the 13th century but the building was not completed until the 16th century. Tour du Gros-Horloge (Big Clock Tower). The huge decorative clock dates from 1889 and still serves its timekeeping functions for the city. Joan of Arc. Joan was captured by Anglo-Burgundian forces, tried for witchcraft and heresy and burned at the stake in 1431 in the city square. Hotel: Concorde Montparnasse Paris. Meals: B - Included. L & D - On Own. Day 14 - June 9. Individual departure on your own schedule to the airport for your return flight to the USA, arriving the same day.